All students, regardless of which school they attend; collaborating with teachers, experts, organizations, local businesses and community partner. Student booths feature scores of activities, displays and presentations related to STEAM (Science, Technology, Engineering, Arts, and Math). Booth participants collaborate with local experts on mutual subject of interest and engage in activities. Booths are designated areas that include a table displaying STEAM interactive exhibits, expert recognition, as well as other artifacts that will engage festival goers. Teachers facilitate student groups. Together they find an expert appropriate for their field of research/interest. 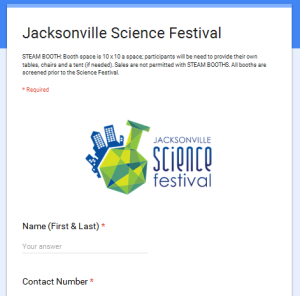 The Jacksonville Science festival hosts workshops to provide guidance with the process of a great project based learning, student-driven booth. Doable Deliverable at a high quality within the constraints of time and resources available. Appropriate Jacksonville Science Festival is a family-friendly celebration and therefore all materials and activities must be appropriate for a family audience. Wow! Fun, exciting, cool, clever, experiential, and conveying the sense of awe and wonder that is at the heart of scientific discovery and achievement. A team of students connected to an “expert”/teacher develop, display, and provide a fun, exciting science activity that has been researched. The science behind the activity and or product is an important purpose for participating in the Jacksonville Science Festival. All K-12 schools in Northeast Florida can have teams apply along with their own experts. You can develop your own team with your experts with a group of students from your home school, boy or girl scouts, faith based organization, 4H team, friends and family, or other groups. Numerous Cash Prizes totaling $1,000.00 are available based on popular vote. Prizes are as followed by school level: High School $500, Middle School $300 and Elementary $200. A College scholarship of $1,000.00 to a single winning participant (High School Only). A team of 6 students have signed up for developing the science festival booth/activity that is in an art installation piece related to the science of engineering. The expert meets with the team based on the agreed upon times and dates. In between visits your student team is at work researching, designing, practicing the related activity in preparation of your next meeting time. As decided by your collaboration you have your last meeting time with the student team a day or two prior to the opening day of the festival. The booth is prepared and the activity is executed as designed and developed by the student team and expert. As a student-driven festival we encourage our student participants to research and contact the appropriate expert of their choice. This action gives them real-life experience and confidence when they are faced with the real world networking environment. Contact university professors of particular departments or courses. College students could also be interested. Contact local businesses, environmental protection groups and professionals in your researched field. Stay updated with our newsletter that will post new experts that have joined to share their expertise with students. A team of students connected to an “expert” (a local business leader, developer, teacher, professor, or other member of the community) who will work with the students to develop, display, and provide a fun, exciting, and well researched science activity project. The project will be displayed in the school-group area booths at the Jacksonville Science Festival. Set up and break down is booth participant’s responsibility. You will need your own tents and tables for Saturday at Sea Walk Pavilion (next to Latham Park) and FSCJ South Campus Display areas must be safe, attractive, and inviting. You must be sure you have enough material for all participants. All groups must bring their own table and chairs. Tent will be provided. Booth participant’s must arrive AT LEAST ½ hour before event start and take down only AFTER event end. All teams must follow equitable practice. If you need electricity please contact us for further discussion.